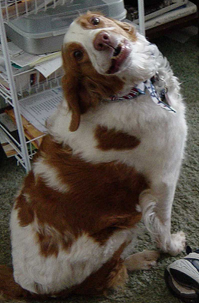 "cawf", "throo", "ruff", "thow", "pohnee", "bah-loh-nee"
WERE = PAST TENSE OF ARE = Where were you? WHERE = A PLACE = Where were you? THEN = A POINT IN TIME = Wash the car first. Then you may play. THAN = A METHOD OF COMPARISON = She was smarter than you! TWO = THE NUMBER 2 = Those two girls are going to the school, too. TO = INDICATES MOTION = It's too hot to stay here for two more hours. TOO = ALSO - OR - EXCESSIVELY = It's too cold to go out. It's too windy, too. YOU'RE = YOU ARE = You're doing well. YOUR = IT BELONGS TO YOU = This is your chair. THEY'RE = THEY ARE = They're over there, at their house. THEIR = IT BELONGS TO THEM = They're over there, at their house. THERE = A PLACE = They're over there, at their house. WHEN IN DOUBT = Say to yourself "it is" anyplace you see "it's". If it sounds right, you're good. If it makes the sentence sound stupid, lose the '. 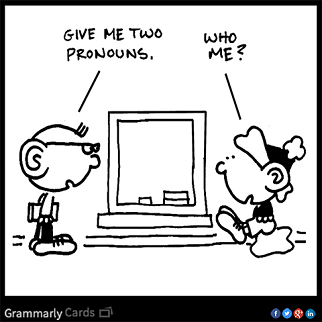 The possessive pronouns are hers, his, its, mine, ours, theirs, and yours. None of them "take" (have) an apostrophe. 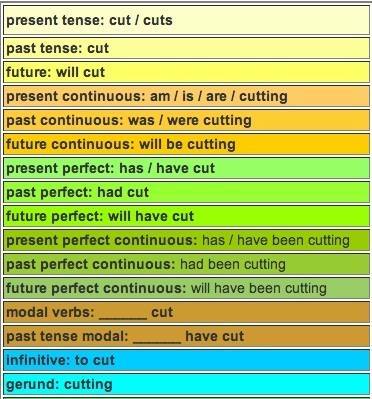 Conjugate the verb "to cut"
5 Minute English is a very technical site, oriented toward ESL teachers - the content is way above average ESL learners. Very valuable for the lesson examples (which teachers could model). Their Grammar section is full of technical terms. 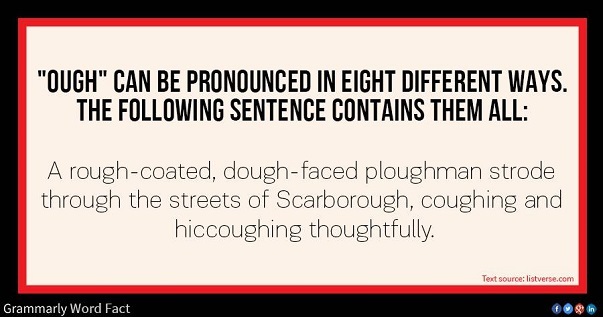 Their pronunciation section minutely goes over phonemes. 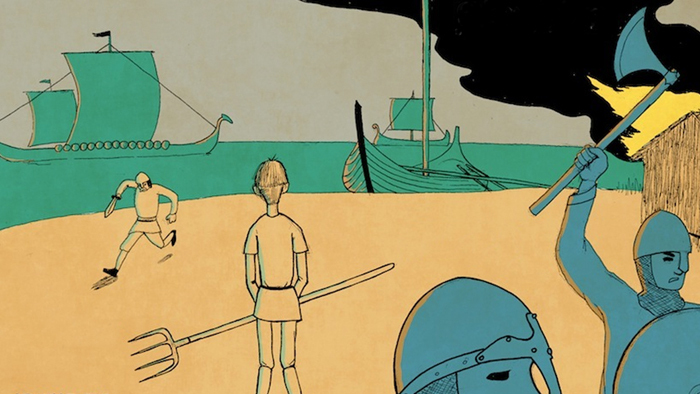 139 Old Norse Words That Invaded The English Language "Without the Vikings, English would be missing some awesome words like berserk, ugly, muck, skull, knife, die, and cake!" "Traust me, þó (though) it may seem oddi at first, we er still very líkligr to use the same words as the Vikings did in our everyday speech. Þeirra (their) language evolved into the modern-day Scandinavian languages, but þeir (they) also gave English the gift of hundreds of words." For more advanced learners, here is an article on Yorkshire dialect*, a Norse-rich tongue from northeast England, where the old Danelaw was. 'appen. Abbott & Costello: Who's On First Classic standup comedy from the 1950s. Probably the most famous comedy bit of all time. Students learning English will find this an excellent exercise in spoken colloquial American English. This is for educational purposes only. Familiarity with baseball is helpful. Activities for ESL Students Thousands of quizzes, tests, exercises and puzzles to help you learn English as a Second Language. A very large repository of ESL help. Teachers and native language speakers are invited to submit their own material. Tons of online quizzes on English grammar and vocabulary, plus crossword puzzles. All are ranks as Easy, Medium, or Difficult. (These could be used with children as well.) Multilingual quizzes for a whole list of languages, Arabic to Zulu! Here's a quiz on Assorted Count and Noncount Nouns from Grammar - Easy. Both ESL teachers and English teachers should find many useful things here. American Phrases and Sayings Research the origins and meanings of dozens of idioms like "bury the hatchet" and search or browse for more. Interesting. 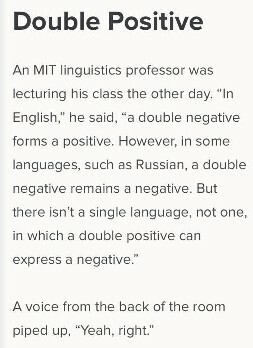 Could be a help for ESL students, too. Athabasca University ESL Course Thirteen online units with 99 lessons. Covers parts of speech, sentence structure, questions, voice, more. All free to you from Athabasca U and Curriki! Basics of English Grammar from TalkEnglish.com A double column of 30 sections of grammar might intimidate anybody! Nonetheless adult ESL students and other adults wanting to better their English speech and writing will benefit by going all the way through this page. Classroom teachers of grammar will find sources for all sorts of lessons for kids. Breathe vs breath Judging from what one reads on the internet, too many people have forgotten the difference. Perhaps you think the two are interchangeable. They're not. breathe = verb "breeth" long "e"; rhymes with breed, freeze, please, seethe, etc. "I breathe, you breathe, he/she/it breathes." "She is breathing." breath = noun "breth" short "e"; rhymes with death, Seth, breadth, etc. "Take a breath." 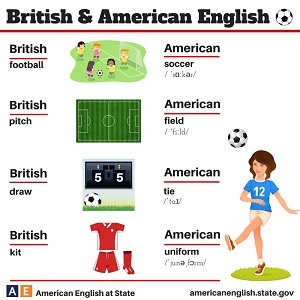 British & American English: Differences By American English at State has six big, cool, colourful graphics that explain differences in word choices. Topics covered are: clothes, automobiles/cars/motorcars, transportation, highways and roads, and vegetables. ColorinColorado "A bilingual site for families and educators of English language learners" This site is in English and Spanish. Este sitio también está disponible en español. "Teachers who work with English as a Second Language learners will find ESL/ESOL/ELL/EFL reading/writing skill-building children's books, stories, activities, ideas, strategies to help PreK-3, 4-8, and 9-12 students learn to read." From Reading Rockets so you know it's good! The Color Vowel Chart "This is a powerful tool for teaching spoken English. It helps teachers incorporate pronunciation into lessons. Check out the chart, the teacher’s guide, and the webinar on how to teach with The Color Vowel Chart. This tool enables teachers and learners to talk easily and accurately about the key sounds of English without the use of phonetic symbols. Instead of phonetic symbols, the Chart uses colors and key words to represent the vowel sounds of English. This provides students and teachers with an easy way to describe and practice spoken English at the word level and at the phrase level." Includes The Color Vowel Chart Teacher’s Guide and Teaching Spoken English with The Color Vowel Chart - Webinar Presentation. Comparative and Superlative Adjectives from TalkEnglish.com This is a one-page intensive dose of the bare facts of the subject, with a quiz. A site for learners who want to learn the material quickly and with no nonsense. Part of a larger site designed for ESL, but very useful for younger students as well. Conversation Pieces: Building Bright Ideas"My site targets students in grades 2-8, and it includes almost 200 book recommendations, and some of those include online book quizzes (over 90), discussion questions, vocabulary lists, and writing activities. I offer writing contests for students, and am adding a new section with Daily Writing Prompts. The site also includes independent study project ideas, online vocabulary quizzes, and a math problem of the week. Students can earn virtual badges in the Hall of Fame for Book Quizzes, Math Problems, and Vocabulary Quizzes when they earn high scores in those areas. Teachers and homeschooling parents can incorporate many of these activities into existing literacy and math programs, or use them to facilitate book clubs or enrichment activities." Wow! Yes, all that and more is in here! What a treasure for teachers! Cookie from Gudlidotcom "Provides Free online learning games, Educational lessons plans, Kids learning games, Free games for kids, Worksheets Etc. Gudli is the best free online games website including many categories like learning games, kids games, math games, puzzle games, science games etc. which are free to use for 'Early childhood Education' and 'pre-school Education' for kids.... Gudli is a unique online experience for kids where they enjoy learning. With our interactive educational games children develop skills in maths, logic, memory, words, creativity and more. Gudli is free, full of fun, easy to use and the ideal learning space for preschoolers to second grade kids." Well, the proof of the pudding and all that: all the activities are colorful, musical, and informative. There are plenty of games and videos, this is a great learning site and will make a fine addition to Good Sites for Kids. Thank you, Neeta Saini, for the email! Do You Know More Grammar than a Fifth-Grader? " Will your elementary school English teacher be impressed with your grammar knowledge? 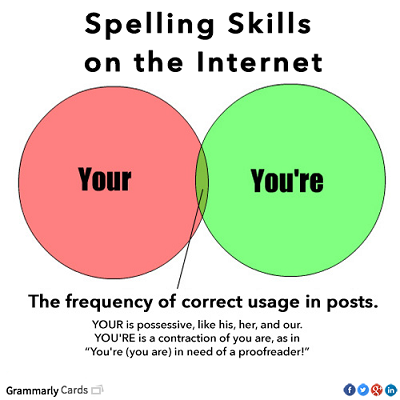 Take this quiz and find out whether you're a true grammar Nazi." A 40 question test ranges widely among parts of speech, spelling, punctuation, and everything else; the more obscure the better. You may find yourself digging through grammar texts to find the true, unknown answer. ESL Lessons & Help from WyzAnt Tutoring. This is a valuable tool for ESL learners. "We are very excited about our growing English Help section and specifically our ESL Lessons & Help page, which provides an excellent resource for those pursuing English fluency. The pages, which are completely free to all visitors, feature unique pictograms, charts, quizzes and articles full of detailed explanations, and relatable references." They are proud of their "detailed, image-rich explanations that go beyond static content with check-able quizzes, a Question and Answer forum and interaction with tutors." This is fairly technical material, but our opinion is teen and adult ESL learners can handle it. The site's presentation is really a help. WyzAnt Tutoring also offers a huge amount of good material to help learn Biology, Chemistry, and Physics. ESL/TOEFL pages from the British Council and the BBC. Excellent source for plans and ideas for teaching English as a foreign/second/new language. 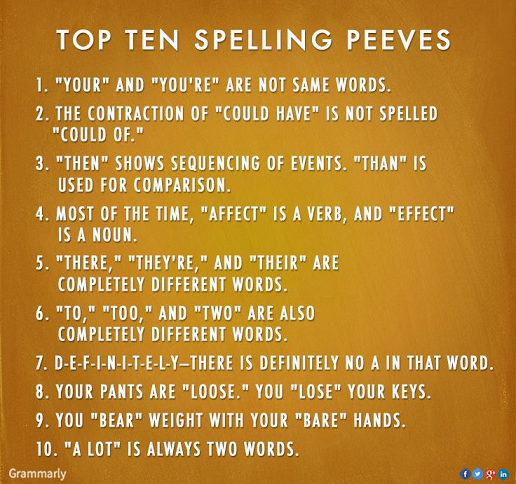 Good source for grammar basics, too. Eating Expressions ESL Vocabulary Quiz "Thanksgiving is an American holiday the emphasizes gratitude. It is typically celebrated by dining on a large meal shared with family and close friends. In honor of that celebration, we wanted to test your knowledge of English words and phrases associated with mealtime. How many can you answer correctly?" englishforeveryone.org "is your resource for printable English worksheets. On the left of this page you will find an index containing hundreds of quality teaching materials...Grade school (K-12), General Educational Development (GED), English as a Second Language (ESL), should be able to benefit from this website. We offer a large variety of accurate and concise skill building resources geared towards a range of ability levels." It's all free for teachers, but they ask that you respect their copyright (details on the front page). FIX YOU’RE GRAMMAR! from Glove and Boots. A humorous short cartoon video concerning grammar and usage. 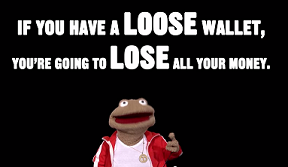 Carefully explains "there, their, they're", "loose/lose", and a cute lesson on "literally". This classic example of comedic timing using slang is an example of the vagarities of American English. It serves as a cautionary tale about grammatic rules vs common spoken English. "Yeah, right." used here is an example of sarcasm. Free Language Arts Curriki Curated Resources! Here are 30 (it lists 33, but #2 and #14 are duplicates) separate collections of language arts lesson plans for middle school, high school, and ESL use. Not 32 lessons but 32 groups of lessons. Some could be adapted for upper elementary. Everything from parts of speech to Shakespeare. Lesson plans, lessons ready-to-go, rubrics, worksheets, videos, and more. Spelling - This resource covers common spelling errors including accept/except, ei/ie, noun plurals, and –ible/able. Numbers - This section discusses numbers, how to write them correctly, and when to use numerical expressions instead. Adjective or Adverb - This worksheet discusses the differences between adjectives and adverbs. 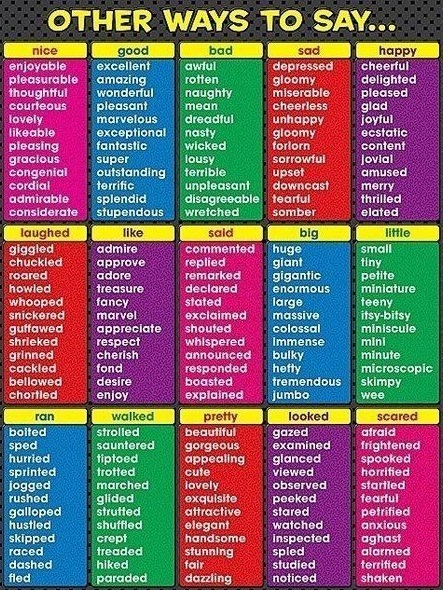 It defines adjectives and adverbs, shows what each can do, and offers several examples of each in use. How to Use Adjectives and Adverbs - This resource provides basic guidelines of adjective and adverb use. Appositives- This handout defines appositives and explains how they are used. Articles: A versus An - This short handout deals with which article to use before a noun -- "a" or "an." How to Use Articles (a/an/the) - This handout discusses the differences between indefinite articles (a/an) and definite articles (the). Prepositions This section deals with prepositions and their standard uses. Pronouns This section has information about how to use pronouns correctly. Count and Noncount Nouns - This handout discusses the differences between count nouns and noncount nouns. 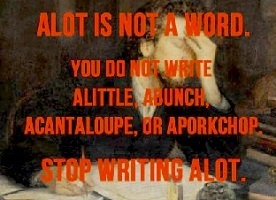 Count nouns can be pluralized; noncount nouns cannot. Subject/Verb Agreement - This handout will help you understand this common grammar problem. Verb Tenses - This handout explains and describes the sequence of verb tenses in English. Active Verb Tenses - This handout gives some examples of the different tenses verbs can have. Irregular Verbs - This handout contains a list and discussion of common irregular verbs. Grammar Monster A monster of a site that helps cure your grammar ills! Grammar Monster will teach you all about grammar, we mean, ALL about grammar! Punctuation - 8 topics and 34 lessons & quizzes. Parts of speech - 8 topics and 27 lessons & quizzes. Confused Words - a couple of dozen pairs and how to use them correctly. A big Grammar Glossary, terms from "abbreviation" to "zeugma" explained. Close to 100 Common Mistakes explained. A Miscellaneous section that covers everything else, such as when to capitalize, parentheses, "they're/there/their", singular/plural, and similar things. Grammatically Speaking is a grammar quiz from Staples Canada. "Whether you’re a stickler for good grammar or just curious about your punctuation prowess, test your grammar know-how with the Grammatically Speaking quiz. Use the dials to select the correct answers and then challenge your friends to beat your score." This is a pretty good on the fly assessment tool. Try it out! Groundhog Day from Starfall. "Groundhog, groundhog, what will you see? Groundhog, groundhog, please tell me!" Clicking on the alarm clock makes the groundhog sit up and rub its eyes. The next frame lets kids click on the words to see pronunciation; then click on the groundhog and it runs up the tunnel! Starfall has a lot more of these, too! I Know an Old Lady Who Swallowed a Fly from Tom's TEFL out of Hong Kong. This is a video of an activity to reinforce vocabulary. It should work with ESL students of all ages and with Early Learners/lower level grade school. It could teach vocabulary, rhythm, intro to poetry, etc. Under the video there are the lyrics used. The activity could be copied and used with your students. Judy Collins - "Old Lady Who Swallowed A Fly" Muppet Show 1977 has the lyrics set to music and is funny for kids and adults! Josie's Poems It's fair to call this site "the biggest poetry website on the internet...knowing how very important rhyming and rhythmic poetry is for helping children develop phonological awareness, a key literacy tool, I’ve just written almost 900 poems for children of all ages." These are GOOD poems to read or to read aloud. 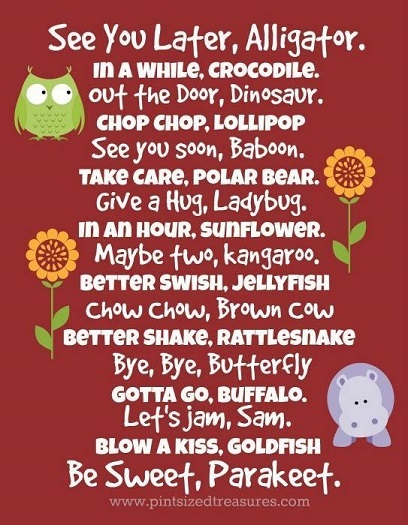 The sort of poems that develop language skills, because they emphasize rhyming, rhythm, the way words sound in the head, mouth, and ear, and demonstrate the use of parts of speech! The haiku, cinquains, adverb poems, similes page is a shining example of how to teach poetry structure and grammar all at once! Read Apostrophe - Mr Blob and see what we're so happy about. There are ebooks, audios, and videos, too, and the chance to buy books (the rest of the site is FREE). This site is also used by ESL students in Europe. The English speaking world badly needs this sort of place on the web - so much of what is in here is no longer covered well (or at all) in many educational environments. We should have posted this site a long time ago. A big THANK YOU to Josie Whitehead, the teacher who created the site and most of the poems! LearnEnglish Kids "LearnEnglish Kids is for children who are learning English. Find games, songs, stories and lots of activities - and learn English too." Games, printables, online songs, stories to read, more. There's also a good section for Teachers of English as a Second Language with lesson suggestions using this site. Learn English Online - Free Beginner's Course 56 lessons (more coming) in 14 Units cover pretty much everything. Designed for ESL, but a grammar teacher of native speakers could pull out specific lessons. One example: Lessons 36 - 38 cover "how much" vs "how many" (uncountable vs countable nouns), and do it very well! Exhaustive without being exhausting. Plentiful examples, self-tests, and plenty of links. figuratively/literally from Choose Your Words (part of Vocabulary.com). "Figuratively means metaphorically, and literally describes something that actually happened. If you say that a guitar solo literally blew your head off, your head should not be attached to your body." 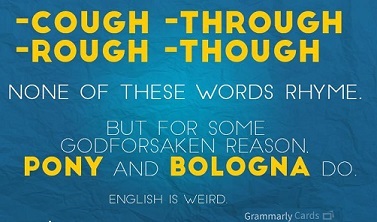 Concise explanation of the difference between these words. Miss Mary Mack Good ol' kids' impromptu hand clapping! This particular song is American, but no one knows its provenance. Kids do this on playgrounds, at home, and anywhere they might get bored (such as in a line). The links all feature the lyrics and demonstrate the various invented clapping rhythms, such as in these three videos. Two sisters do their version on a sidewalk in this clip. Someday, someone will get an advanced degree in Linguistics analyzing these clapping songs. The Old Man and the Grandson - Intermediate Level Reading Comprehension from About.com. Suitable for ESL or for enlarging the vocabulary of native English speakers. One of several Grimm's tales used for reading comprehension in this section, scroll to the bottom to see more. and different degrees of intensity. So thank you, Mr. Caxton. Paragraph Shrinking from Reading Rockets "Paragraph shrinking is an activity developed as part of the Peer-Assisted Learning Strategies (PALS). The paragraph shrinking strategy allows each student to take turns reading, pausing, and summarizing the main points of each paragraph. Students provide each other with feedback as a way to monitor comprehension." Everything is explained on the web page, with a video and printables. Phrasal Verbs By American English at State has 29 different graphics, each explaining different verb phrases ("phrasal verbs"). Examples are take:after, up, off, in, down, out; and put:away, up with, away. All 39 are at this link. Prehistoric Animal Brigade This rhythmic little kids' song is from Australia! It's been popular down under for many years. Watch the videos, see the movement, and you'll quickly understand why! It's repetitive, it gets kids up and moving, and it "Must be sung loud and raucously, with not too much attention to correctness of lyrics." This version, "Our Keira singing the Prehistoric Brigade song", shows that even awesomely cute toddlers can claim the song as their own. Alternate Version 2 Audio only, a female chorus sings, accompanied by a big band. Alternate Version 3 Audio only, part of the Josephine's Action Songs For Children series, sound track written for dancing. Watch them all, then make up your own! Sentence Diagram Enparser This will automatically diagram a sentence for you, should you need that done. Provides insight into sentence structure. Sight Words from Quiz-Tree It says the words! Realizing that some of our younger kids were memorizing their little easy reader books, we went looking for something online to reinforce their sight word knowledge. Shortly after clicking on this site's pre-primer word list, a teacher commented: "We need this site!" Each Sight Word is said aloud when it's clicked. We suggest having students try to say the word, then click on it. Part of a larger academic site, and free membership brings lots more goodies. Signing Savvy THE place to go for ASL! "Signing Savvy is a sign language dictionary containing several thousand high resolution videos of American Sign Language (ASL) signs, fingerspelled words, and other common signs used within the United States and Canada." Watching a video of the signing is way better than looking at a picture with confusing curving arrows. This site will help you learn ASL! Includes search for words and phrases; or browse by letter. Look up fingerspelling, numbers, colors, animals, geography, baby signs, more! Free but limited access for guests. Full membership gives unlimited access to all site resources for $50 a year. Normally we would not run pay sites, but if you need to learn to sign this is worth it. Thanks Corey W. and Teri T.
Starship English KS-1 level English games from the BBC. Covers homonyms, synonyms, sentence structure, syllables, irregular verbs, spelling, and more! Our fave so far is Story Plant, a scaffolding game, where kids string together sentences to make a story, with a cartoon helper who gives tips and explains concepts such as the "W"s of Who, When, Where, Why, and What. Vocabulary Workshop Online from Sadlier-Oxford Educational Publishing. Six levels of vocabulary with 300 words per level. 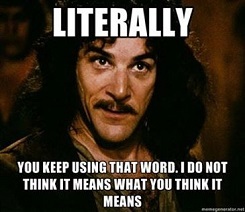 Click on a word and and hear it pronounced in QuickTime. Two additional levels feature Hangman, Word Search, Crosswords, and Multiple Choice. Section for Families and another one for Teachers. All this from one start page that uses popups - so don't have popups blocked. What Are Count and Noncount Nouns? 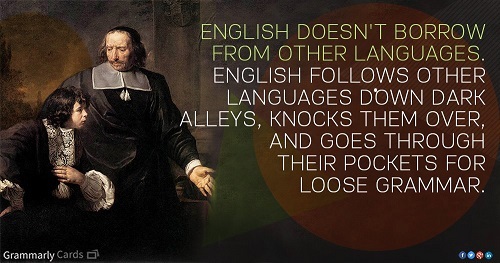 from Grammar Blog is for ESL students trying to better understand our impossible language. Count nouns usually are not a problem. Four trees, 15 liters, one kilometer - not a problem. But, "How can you indicate relative amounts of noncount nouns?" 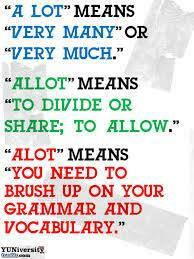 1 - Use a quantity word and the preposition “of” in front of the noncount noun. "How many head of buffalo are being auctioned off?" or "I have plenty of money." 2- Make the noncount noun an adjective by placing it in front of a count noun. The examples in the article are sufficient. There's a discussion of words can be both count and noncount nouns, and ways to handle them. Re: popcorn. It is a noncount noun. Why? Try counting all the kernels in a container of popcorn. Treat like any other noncount noun. "Let's each get a bucket of popcorn." "Buy a small sack of of rice." "Whose" = possessive of who. "Who's" = "who is", just as "it's" = "it is"
"Whose car is this? Who's the person that left the car door open?" Word of the Day from Merriam-Webster Online. Every day a new word: its definition, usage in a sentence, origins. The Archive covers the words for the previous two months. You'll want to bookmark this one. ZZCad Sentence Parsing Program "Type a sentence in the box below, and click on the button to see its parse." This will automatically break down a sentence into component parts and subsections, and show how they relate to each other. Parsing lets you choose words and word order, to convey shades of meaning. Parsing is a skill that can be learned. 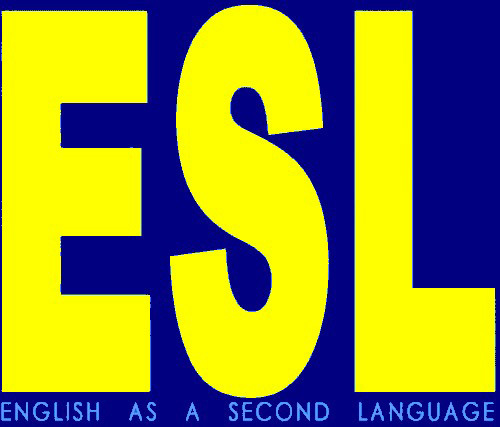 ESL? Why? I already know all the English I need!